There Must Be More To Life Than Dishes and Laundry...: When Life Gives You Lemons, Make Lemonade! I leave work at a reasonable hour (around 5:30pm), kids in tow head home to make dinner. I start chopping onions and cooking ground beef for chili. I put the chili pot on the stove, add the tomatoes, grab the kidney beans, and wait where are the chili and pinto beans? I am positive I had them since I put chili on the menu this week. You guessed it, they aren't there. My next thought is crap, dinner is half ready and I need to run to the store real quick. Too bad hubby in traveling for business. I better modify. Thanks Rachel Ray for teaching me that cooking is approximate not an exact science. No need to measure, substitutions welcome. Cell phone camera picture sorry hubby took real camera on his trip. 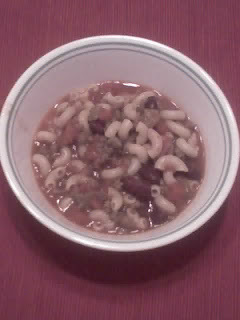 I quickly doubled the diced tomatoes, doubled the green chilies, doubled the spices, boiled some elbow macaroni, and added some water to make up from the liquid that would have came from the other two bean cans. I was delicious! I am so proud of myself! Well done. I hate it when I forget things at the store, for some reason I always seem to forget cheese. I posted a pretty yummy Chili Mac recipe over at MWOB not too long ago and it really is a great go to meal especially since most of the stuff is in the pantry already. How smart are you! Don't you just love Rachael Ray! that looks yummy... i love when smarts kick in during a crisis! that is awesome. way to go!